Home ➔ News ➔ Blog ➔ Win Simon Mayo's New Book! Win Simon Mayo’s New Book! 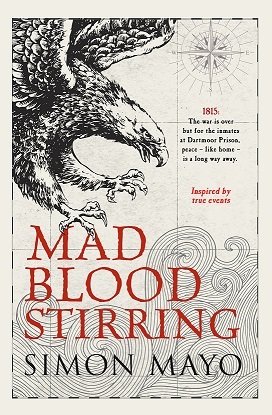 To celebrate our first event of 2018 we have 2 copies of Simon Mayo’s new book, Mad Blood Stirring to give away! Book tickets to see Simon at the Kings Hall on 24 April by 5pm on Friday 20 April to be in with a chance of winning. Simon Mayo is one of Britain’s best-loved and well-known radio presenters. He has worked on BBC radio since 1981 and is now the presenter of ‘Drivetime’ on BBC Radio 2, which features the regular ‘Book Club’ show. He is also the co-presenter of ‘Kermode and Mayo’s Film Review’ on BBC Radio 5 Live. Simon comes to Ilkley to talk about his debut adult novel. Inspired by real events and real characters, Mad Blood Stirring tells the story of a thousand black American sailors held captive in Dartmoor Prison in the Second War of American Independence. Click here to book your tickets and enter the competition. Closing date for entry will be 5pm on Friday 20 April. After this date the no further entries to the competition will be permitted.